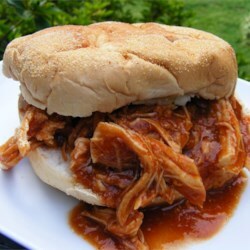 For some reason my slow cooker often sits in the cupboard gathering dust, so I decided today that I would try out a new recipe for zesty slow cooker chicken barbecue. I found the recipe on allrecipes.com a while back, but I hadn’t got the chance to try it out yet. The nice thing about slow cookers is that many recipes, like this one, require dumping a bunch of ingredients in the cooker and setting the timer for around 4-8 hours. You do definitely need to plan these meals out in advance so you make sure you get them started in time….unless you like to eat after 10 pm once you remember to start the timer at 6. This recipe was super simple and it has given me a lot of ideas for slow cooker meals to do in the future. Seriously. Two directions, that’s it. As you can tell from the picture, you can shred the chicken and put it on a bun, which is actually the way I chose to do it. Once the chicken has cooked for that long it is pretty much already shredding on its own; however, I found the easiest way to shred the chicken was to take two forks and pull them in opposite directions across the chicken; it will come right apart. You may want to do this and then let the chicken cook for another 5-10 minutes so that the inside of the chicken can take on the sauces flavors. I also added some additional barbecue sauce at this point. For the buns I think you could pretty much put this on anything and it would be really good. I used ciabatta rolls and toasted them in the oven with a little melted garlic and butter brushed on the tops. Overall, I would definitely do this recipe again. I probably would have used a touch more Italian dressing for the extra zest, but other than that, I wouldn’t make any major changes. I think next time I will try this with pork, since I am a sucker for a good pulled pork sandwich. What are your favorite slow cooker recipes? I would love to try out some more, and see how it goes. If you make this recipe, let me know how it turned out and what delicious updates you made! Thank you to allrecipes.com for the recipe and picture.